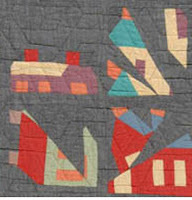 A member of the Seamsters' Union was scrolling through the quilts at the International Quilt Study Center & Museum website recently and came across this quilt that our sewing group made in 1987. Developers and preservationists were at odds. 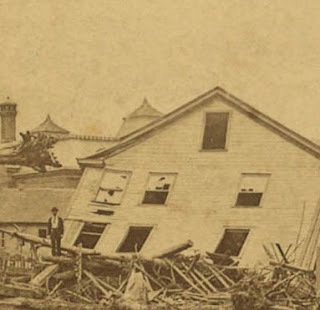 The above mentioned bank, situated at the edge of a lovely Victorian neighborhood, felt they needed a giant parking lot and bulldozed a block of houses at dawn one morning before any one could protest that the historic buildings were worth saving. We had no preservation organization and no state laws with any teeth in them to prevent such destruction. Those of us who valued the architecture in our historic town could do nothing but watch in frustration. 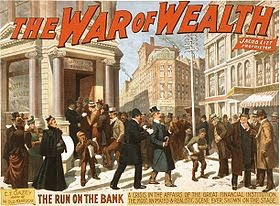 We did take our money out of the bank---emptying several accounts amounting to the high two figures. The Seamsters decided we'd strike back with a quilt depicting the bank as the aesthetic villains they were. 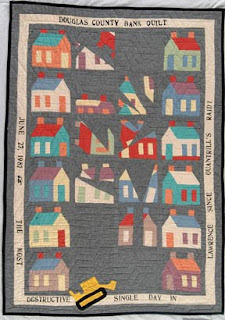 Our inspiration was a quilt Jean Ray Laury'd made about a California earthquake in which she silk-screened broken houses. "I remember stenciling the border caption, and I remember making and cutting up house blocks. My most vivid memory is setting it up on a quilt frame at the public library and inviting people to stitch on it until [representatives of the banking and development interests] pitched a fit and got us thrown out." We then moved the quilting frame to a public park and spent some summer evenings quilting the bank's logo into the background. The quilt was published in Americana magazine, April 1988. We raffled it off to raise money to start a preservation organization. The lucky winner has apparently donated it to the IQSC. Douglas County Bank Quilt. June 27, 1987, The Most Destructive Single Day in Lawrence Since Quantrill's Raid. 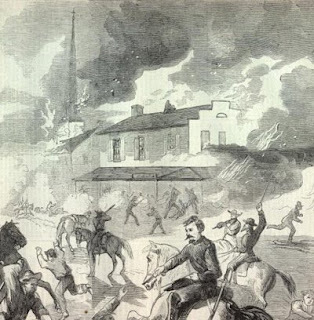 A depiction of Quantrill's Raid during the Civil War when the town was burned. I am really intrigued lately with quilts that make a statement about current events. What a great quilt. any more examples of quilts that made a statement? What a great way of protesting the destruction of part of the town's history. What a great story and to see it donated to the museum, how wonderful.